The main objective of this concept is used to apply the gear by using automation system in automobile vehicles. This is the new innovative model mainly used for the vehicles to control the vehicle. Here we are concentrating to design the automatic gear changing mechanism in two wheeler vehicles by using the electronic devices. This is very useful for the gear changing mechanism in automobile vehicles. By using this we can easily control the vehicle and improve the performance of the vehicle also we can avoid the wear and tear of the gear. for reducing the gears. The gears are applied on the vehicle depending up on the speed of the vehicle. 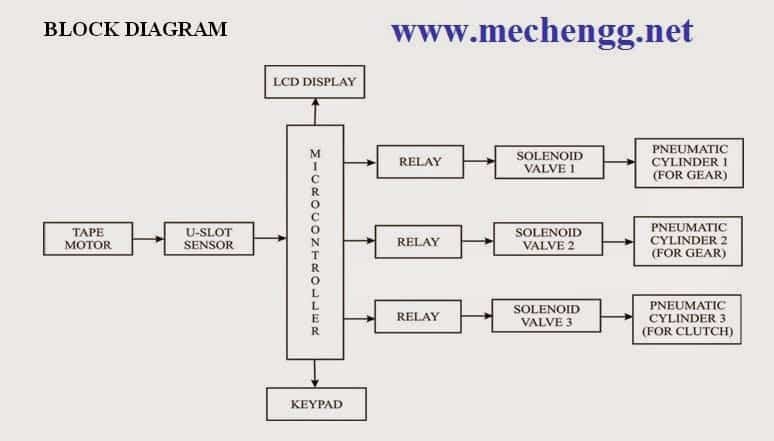 The speed sensors are placed near the wheel the sensor sense the signal and give the output signal to the control unit. For this purpose, here we are using a tape motor with a U slot sensor such that the speed can be varied through the tape motor. Depending up on the signal the clutch and gears will automatically changed with the help of the control unit. When the vehicle speed increases automatically the clutch and the gear will change in the vehicles. The arrangement is clearly shown in the below diagram. We need to alter gear shifter which may increases the vehicles weight and will reduce the drivers comfort. It is applicable in all types of two wheeler vehicles. 4. (Buy Project) Mechanical Project On Automatic Gear changer.